The Russian warships in Syria’s coastal waters targeted and destroyed a foreign military operations room in Dar Ezza region in the Western part of Aleppo near Saman mountain, killing over two dozen Israeli and western intelligence officers. The foreign officers who were killed in the Aleppo operations room were directing the terrorists’ attacks in Aleppo and Idlib. 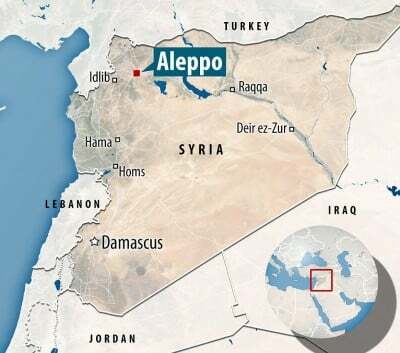 “The Russian warships fired three Caliber missiles at the foreign officers’ coordination operations room in Dar Ezza region in the Western part of Aleppo near Saman mountain, killing 30 Israeli and western officers,” Sputnik quoted military source in Aleppo as saying on Wednesday. The operations room was located in the Western part of Aleppo province in the middle of sky-high Saman Mountain and old caves. The region is deep into a chain of mountains, FNA reports. Earlier in September, the Syrian army units launched a preemptive strike on the terrorists of the so-called Aleppo Operations Room in their gathering centers near Castello road in the Northern areas of Aleppo and Mallah farms, foiling their plots to attack the region’s supply route, a source said. Also, the Syrian air force attacked the terrorists’ supply route in Northern Aleppo towards Hayyan and Adnan as well as the supply roads in Western Aleppo towards the North and smashed the terrorists’ convoys in al-Aratab, Urom Kobra and Maara al-Artiq which thwarted the terrorists’ plots and forced many of them flee towards the Turkish borders. “A number of key warehouses of Khan Touman are now under the Syrian army’s control,”, FNA reports. The source noted that the Syrian air force and army’s artillery units also targeted the gathering centers and fortifications of the terrorists in Khan Touman.